Love to cook but don’t love the leftovers? Whether you’re a newlywed or moving out on your own for the first time; an empty nester or simply cooking for a small household, Taste of Home Cooking for Two helps you whip up mouthwatering meals in just the right quantities. All of the 141 dishes in this sensational collection are just right for one or two diners. From snacks and appetizers to entrees and desserts, the perfect dish is always at hand. Best of all, each recipe includes a complete set of Nutrition Facts, prep-and-cook timelines and step-by-step directions. 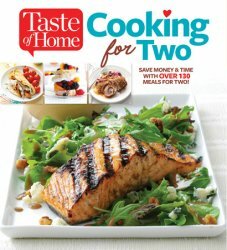 With full-color photographs, heart-smart dinners, 30-minute dishes, 5-ingredient recipes and more, Cooking for Two is your guide to quick-and-easy dishes sized right for a pair.